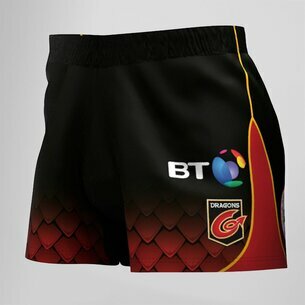 Show where your loyalties lie in training, on the streets or even at the Rodney Parade in these Dragons 18/19 Kids Alternate shorts from VX-3. Core Playing shorts are made for training or playing on the pitch. Featuring an elasticated waist with an adjustable drawstring to create a secure fit. These shorts come in royal blue with the faded dragons scale design to match the alternate shirt with the VX3 logo on the right, as worn and the club's crest on the left. The back of the shorts feature the club's sponsors.